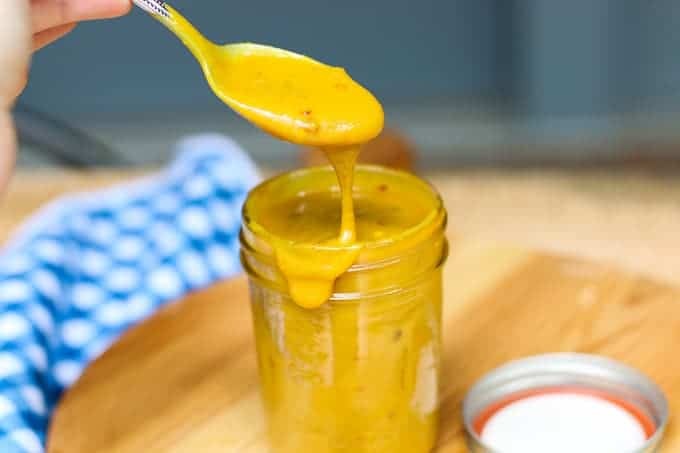 Carolina Mustard BBQ Sauce is a little sweet from honey, a little tangy from apple cider vinegar, and a little spicy from red pepper flakes. It is delicious poured over pulled pork or slathered on grilled chicken. It is the perfect homemade BBQ sauce to have on hand for your cookouts. We did my favorite thing this Memorial Day weekend and cooked Pulled Pork. Juicy, slow-cooked pulled pork is my love language and my husband knows how to swoon me over. He has mastered cooking pork butts and every time he cooks one my heart skips a beat. Our secret to a happy, loving marriage is his skills on the Green Egg. Just check out these beauties! My blog is pretty famous for my Carolina Barbecue Sauce Recipe. It is a Southern vinegar based barbecue sauce that is delicious poured over pulled pork and topped with cole slaw. It is umm… umm.. good! Want to know what else is good? This Carolina Mustard BBQ Sauce! What is Carolina Mustard BBQ Sauce? Carolina Mustard BBQ Sauce is vinegar and mustard based. It’s roots come from South Carolina and has trickled into the homes of some of North Carolinians. 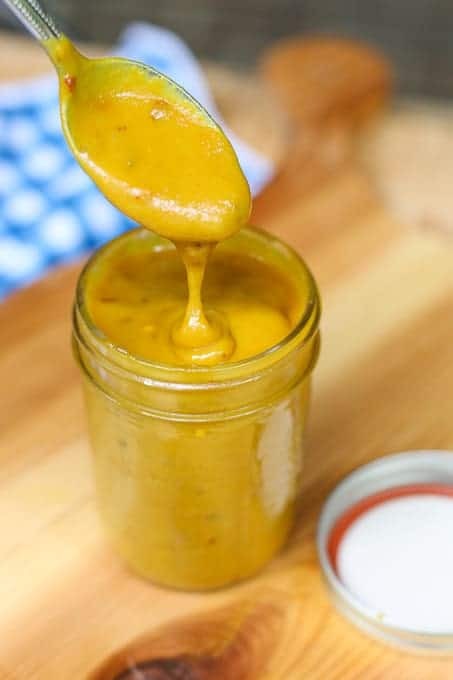 Unlike North Carolina bbq sauce which is vinegar based with ketchup, brown sugar or molasses, the Carolina Mustard BBQ Sauce is based with mustard, vinegar sugar and/or honey, and spices. The result is a tangy, sweet, slightly golden bbq sauce. 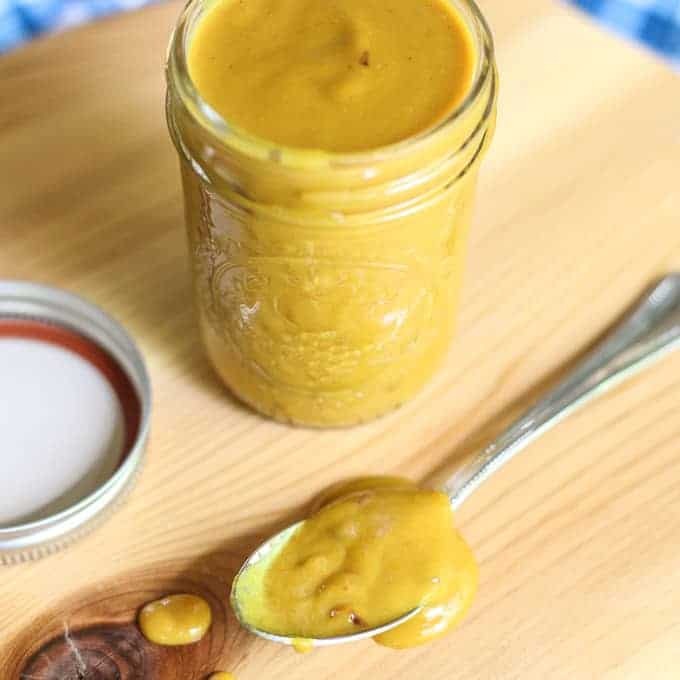 This Carolina Mustard BBQ Sauce is also known as Carolina Gold Barbecue Sauce. It gets it’s name from the beautiful gold color it produces. My husband isn’t a huge mustard fan, so this isn’t his favorite bbq sauce. However, I love the sweet and tangy mixture. I never stop at one helping with barbecue, so I am often interchanging all the lovely sauces. Although this sauce is DELICIOUS on some pulled pork, it makes a tasty sauce for grilled chicken and grilled ribs. Pour some of that golden love over either of those meats and you have a fantastic meal ahead of you. I add 1 tablespoon of red pepper flakes to give a little kick. I don’t think that makes it too spicy. If you want it to not have any spice, you can omit the flakes. If you want more heat, add another tablespoon. Enjoy!! Looking for a Sweet, Thick Sauce to buy? 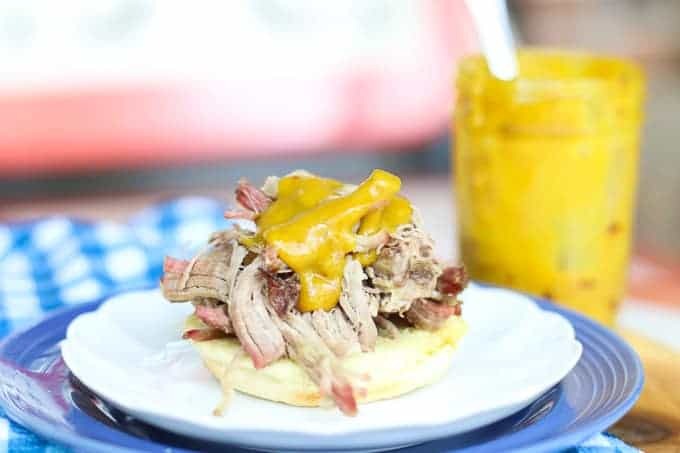 If you are a barbecue lover living or visiting North Carolina, be sure to try out these restaurants: Parker’s BBQ in Wilson, NC, Pik-N-Pig, and B’s Barbecue. Combine all ingredients in a sauce pan. Mix. Cook on low heat stirring continuously to prevent scorching for 5 to 7 minutes. We just had it with pulled pork on sweet Hawaiian rolls. Amazing!!! This was so good. My picky husband loved it. Licked his fingers clean so that’s 5 stars in my book! I am so glad you enjoyed it! Thanks for sharing! Made this today for some pulled pork. It’s great. Tell me why I have been buying sauce again! I am so glad you enjoyed it! Thanks for letting me know!! “Go To” BBQ SAUCE. FIVE STARS. Made this yesterday and we loved it. Great on pull pork. But the color is not the same has the recipe. Dont,undrstand that. We make again for the next cook out. As a couple of BBQ sauce enthusiasts, we’re definitely going to have to give this one a try on some pulled pork! Absolutely gorgeous looking recipe. That sauce! Ohh!! Just want to dive in. Absolutely delicious. How long can you keep this in the fridge do you reckon? I’d love to make some and keep in the fridge for this bbq season. Thanks for sharing this delicious sauce recipe. We have plans to light up the bbq this weekend so a recipe like this will definitely come in handy. Can’t wait to pour it over my meat. Thanks for sharing. This looks so delicious! I don’t know if I have ever had the liquid Gold! I will have to remedy that and make your sauce because it looks amazing! Oh this looks fantastic! So many ideas come to mind for this yummy sauce! Sweet + spicy + tangy = perfection. Oh this looks so good! I actually just made us a big piece of pulled lamb shoulder tonight so will happily make this gorgeous sauce to pour over the leftovers. Yum!